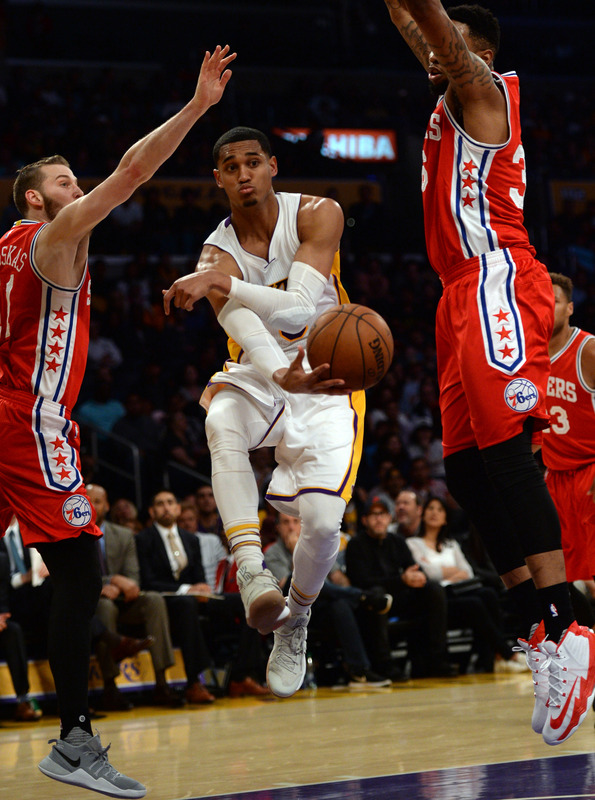 Los Angeles Lakers guard Jordan Clarkson (6) passes the ball around Philadelphia 76ers guard Nik Stauskas (11) and Philadelphia 76ers forward Shawn Long (36), during the 2nd quarter, at the Staples Center in Los Angeles Calif., Sunday, March 12, 2017. HOUSTON — For the next few hours, Lakers coach Luke Walton will think long and hard about what to do with his lineup. He already has determined that Lakers guard Jordan Clarkson will start at point guard for the second consecutive game when the Lakers (20-47) visit the Houston Rockets (46-21) on Wednesday at Toyota Sports Center. Walton has yet to decide who will start with Clarkson in the backcourt? Will it be Lakers second-year guard D’Angelo Russell, whose bench role in Monday’s loss against Denver marked the first time this season playing as a reserve? Will it be guard David Nwaba, who has started for the past two games in the middle of his second 10-day contract? Will it be Lakers veteran guard Nick Young, who has sat out the past two games so Walton could allocate more minutes to his younger players? Walton has established clarity on his other options. The rest of the starting lineup will feature rookie forward Brandon Ingram, third-year forward Julius Randle and rookie center Ivica Zubac. Walton will still play Young an unspecified amount of minutes. Walton will also pair Clarkson as a primary ball-handler at times with Russell as an off-ball guard, a combination Walton used at times in Monday’s game against Denver. Former Lakers coach Byron Scott had actually tried that combination in Russell’s rookie debut last year, but immediately scrapped it after all involved reporting feeling uncomfortable with it.